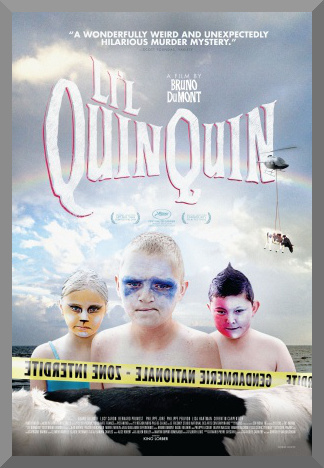 Bruno Dumont’s Li’l Quinquin is an unexpectedly farcical and slapstick production for the director, more commonly known for his realistic and raw examinations of life. Instead, this film, originally shown in its home country of France as a four-part miniseries, combines the gruesome with the humorous, the impactful with the nonsensical, in a comprehensive 206 minute story following a series of murders in a small coastal town in northern France, and the surreally incompetent investigation that follows from the county police. It’s a unique and strangely enchanting experience, as Dumont throws us through a chronological path, from oddity to oddity as layers are peeled back, never very neatly. Comparisons to a lopsided, European variant of Twin Peaks wouldn’t be out of the question. I don’t believe the town is ever named, but it’s clearly a small, hickish-if-you’ll-excuse-the-term settlement that is unexpectedly thrust into the media spotlight when the decapitated corpse of a 45 year old woman, Mrs. Lebleu, is found dismembered with the body parts stuffed into a dead cow. Helicopters lift the cow, abandoned in a field, up above the ground, as it sways and turns, while a handful of local kids, notably the pottymouthed and arrogant Quinquin (Alane Delhaye), look on. Around twelve or so, Quinquin is as biased, backwoods, and bigoted as a nineteenth century plantation owner. With school out for the summer and nothing better to do, he becomes a common element/deterrent for county officer Commandant Van der Weyden (Bernard Pruvost) and his assistant Carpentier (Philippe Jore), sent in to sort out this bizarre case. Befuddling theories are set forth, passing it off as some kind of isolated incident, until another body of a town resident is found. And another. The body count keeps rising. Clearly, something is up, if that wasn’t obvious already. Dumont continues his tradition of casting local, nonprofessional performers here. And as a result, there’s a particular degree to which they add to the aesthetic of the film. Dumont didn’t write a story for characters with movie-star good looks, and so he doesn’t cast overly attractive people – in fact, no offense intended to them, he casts people that look funny or strange instead. Pruvost’s commander character is often Einstein-ish in appearance only, as his face twists and turns in bemusement of simple disbelief of how comically high his work has been cut out for him, from the oddities of the landscape to the cluelessness of Lt. Carpentier, who in one scene picks up the commandant by driving the police car down a country road in what can only be described as the four-wheeled version of a wheelie, with the vehicle moving on its two right-side wheels, tipped as it careens down the pavement before thudding back down to let Van der Weyden in. By the time Li’l Quinquin has rolled around to its conclusion, Dumont has had the opportunity to address a lot of issues that didn’t seem like expected subject matter going in, namely discussion of issues involving racism and intolerance. How exactly it happens is a detail I’d rather leave unspoiled for you. The fact of the matter is that underneath all of the wonderful weirdness and comedy at hand, Dumont has not sacrificed substance or plot coherence, and is able to move from piece to piece with some degree of clarity and clear-headedness. However, the 3½ hour runtime seems a bit overt and unnecessary. Having split the viewing into two chunks (episodes one and two on one night, episodes three and four on another, much as it was aired in France), I feel like I was able to look past the grueling runtime and view it more on its own merits, but I question the wisdom that American distributor Kino Lorber had in releasing it as a movie – a three hour and twenty-six minute long movie. Dumont likely made this with the intent of incremental viewing, not as one sit-through marathon. What I’m saying is that it doesn’t feel very binge-watchable. But failing at a test it wasn’t technically attempting is hardly a valid criticism to seriously detract from all that Li’l Quinquin achieves. It’s still fantastically batty and in a league all to its own, with each successive type of comedy on display drenched in darkness. It’s entertainment at some of its most perverse forms, amplified by gorgeous cinematography from Guillaume Deffontaines. Carefully construed, from its eccentric (and eccentric-looking) cast to plot tics that often take what would be a mundane scene and drive it to entirely different levels (such as a conversation in a restaurant periodically interrupted by a mentally challenged character throwing plates and silverware onto the hardwood floor with loud clangs), this is certainly far from the mainstream in terms of a traditionally defined “murder mystery”, but when you’re carving out a new niche in such a shameless way, what’s wrong with that? P.S. : Unless you really know what you’re doing, I would advise against watching the whole thing in one go. Even my two-part viewing was occasionally layered with a not-unremarkable test on my patience.